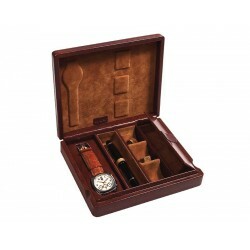 2 watches on flexible cushions diameter of watch, case and crown area (up to 45 mm). Cufflink cells, 2 free pockets to keep rings and necklaces and 3 slots for fountain pens. 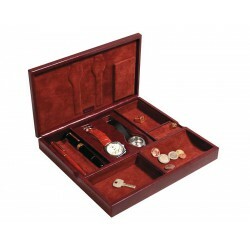 With a portable travel jewel case for 2 flat-lying watches diameter of watch, case and crown area up to 56 mm and jewels. 90º cover opening; external magnetic closure. External part is covered with leather and the internal one is made with velvet lining.